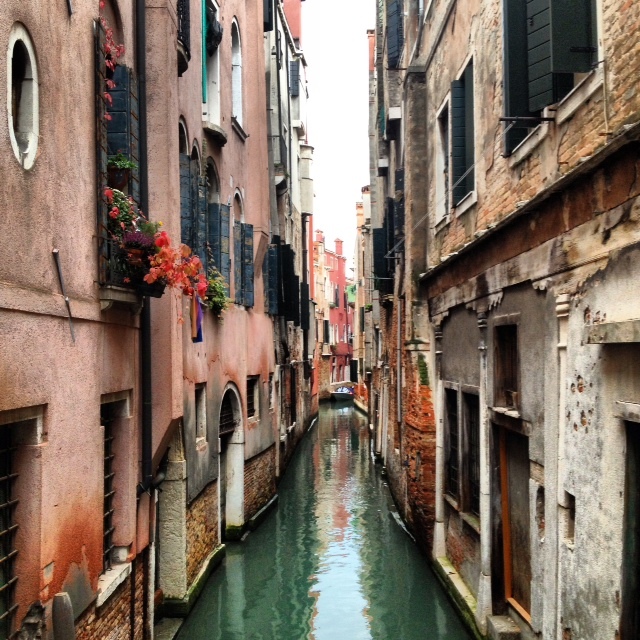 Venice was really amazing – everything I expected it to be and more, and nothing like I have ever seen. The canals, the boats and the gondolas, the narrow streets and lane ways, they all looked like they had just jumped out of a postcard! It was really beautiful, despite the hoards of tourists and smelly water. Having never been to Italy, but being a huge fan of Italian food, I couldn’t wait to get stuck into the local haunts. Venice certainly did not disappoint! Firstly, the wine in Venice was delicious. I, as well as my boyfriend, are quite fussy, but we had the most delicious Pinot Grigio, and partnered up with my scrumptious duck ragu with fresh spaghetti, was a match made in Venetian heaven! My favorite foodie place visited in Venice was a teeny tiny almost booth like pasta joint called Alfredo’s Fresh Pasta to Go. It was number 1 on TripAdvisor, and it definitely lived up to expectations. Alfredo’s make all their pastas and sauces on site, and cook your pasta directly in front of you. I also loved the way you could choose your dish with a number system, picking your choice of pasta and sauce. The pasta is served in little cardboard boxes similar to noodle boxes, then you can go and enjoy your delicious dinner sitting on a little Venetian bridge – perfect! We went twice in our 3 day stay, and the first time I had a penne ‘Ciao Bella’ which was a delicious combination of cream, curry paste, fresh tomato, zucchini and Parmesan – it was unlike any pasta sauce I’ve ever eaten, but it’s definitely one I’d like to recreate at home! The second time, I had fresh fettuccine with a sauce called ‘Chickenese’ – basically a bolognese make with chicken. It was so yummy, I wish I could get my sauces to taste the way the Italians do! So simple, yet so amazing!! If it hadn’t been for this one amazing local restaurant, I probably wouldn’t have added Sorrento into this post. Unfortunately, we didn’t have the best time in Sorrento – which was mainly due to our hotel, but still, there wasn’t a whole lot of food that stood out. I’m sure many people would disagree with me, this was just our experience. Unfortunately, when you have been constantly travelling around for a long time and have seen so many countries and cities, moving around every few days becomes tiring and new places can lose their luster. You can become frustrated when little things don’t go in your favour, and can easily disregard the fact that you are in Italy, on the beach, looking over Mount Vesuvius, next to a cliff face! We had definitely hit the wall at this point and were extremely tired. Luckily, this little restaurant was our savior, and was definitely the highlight of our Sorrento experience. This restaurant was what I really wanted to find in Italy – small, family run, inexpensive and with all the quintissential Italian classics. 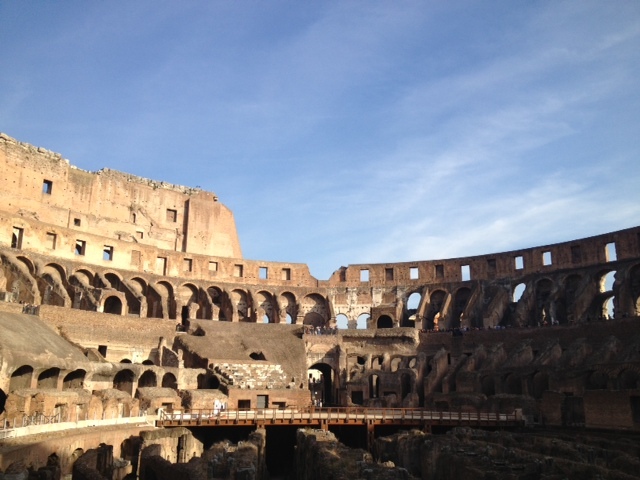 It was awesome, and we visited it every night we were in Sorrento! 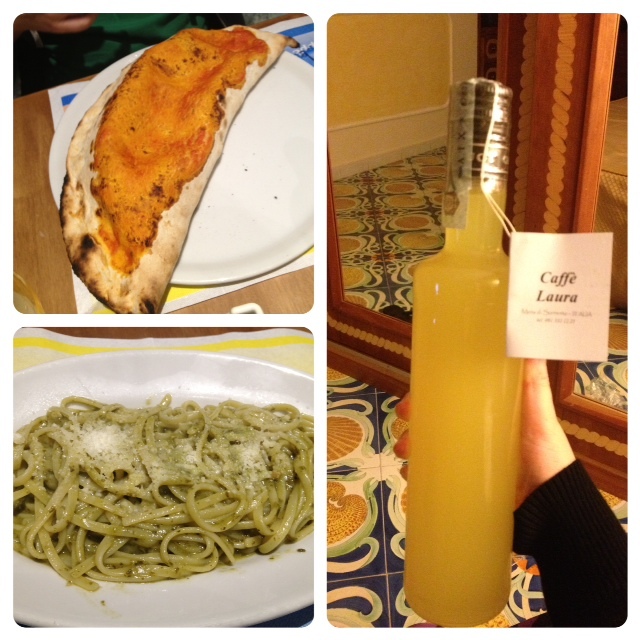 From pizzas to soups, freshly made pasta to calzones and delicious salads, they had it all, and it was great. As it was small and out of the main area, it really felt like you were welcomed into the owners home for dinner, and they actually ate their own dinner in the restaurant, too. With plastic placemats and your knife and fork in a small paper bag, it was also unpretentious. Plus, the owners make their own Limoncello – how could I resist?! If anyone is ever in the Sorrento area, I urge you to take a detour to Gran Caffe Laura, you won’t regret it! Sorrento is the capital of Limoncello. You can buy Limoncello/Lemon everything! 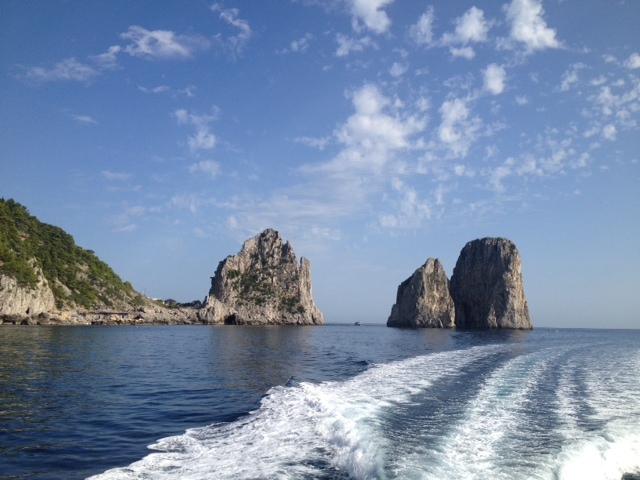 I had the best gelato in Italy on the Isle of Capri – which is a stunningly beautiful place. Limoncello and Strawberry! 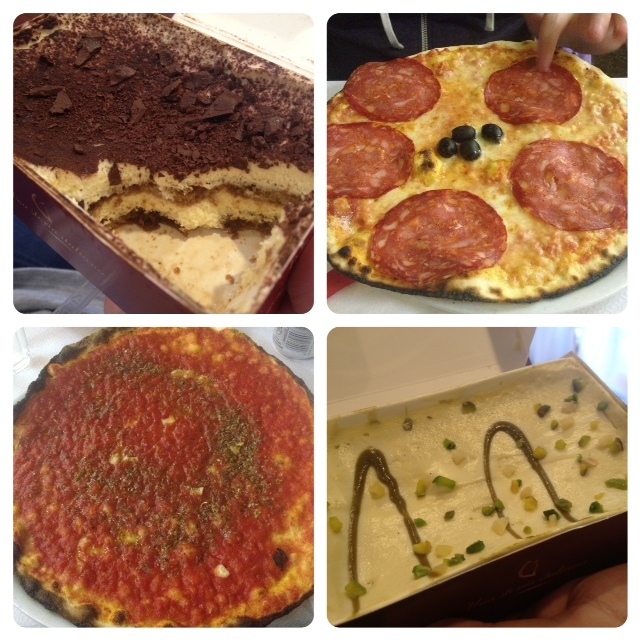 When in Rome…eat as much as you can! We definitely did. We had two real foodie highlights in Rome, one of them being a tiramisu that is hailed as Rome’s best. These two places were both in the area where we stayed which was just south east of the city in the Ponte Lungo area. The tiramisu was absolutely amazing, and I would happily revisit Rome for the sole purpose of eating more! This is coming from someone who has never been a huge fan of tiramisu and who doesn’t drink coffee! We were lucky that it was only round the corner from where we stayed. Bar Pompi has a few flavours of Tiramisu – the classic coffee, pistachio, hazelnut, banana and nutella and strawberries and cream. We tried the first three – the classic was definitely my favorite, and my boyfriend loved the hazelnut. The other foodie highlight in Rome was a great pizza place recommended by our host. Pizzeria Dal Bersagliere served the thinnest and crispiest pizza I’ve ever had! I know that many people don’t enjoy really thin pizza bases, and I found it a little different, but this is the traditional way the crust is made and is how the majority of pizzas are in Italy. The toppings were simple: margherita, marinara, napoli and so on. No meat lovers or bacon cheeseburger in sight! We personally found the best Italian pizzas to be crispy at the edges and a little doughy in the middle, but still holding its form so the pieces would not fall down in the middle, and not soggy. This place definitely hit the spot, and I would recommend it to anyone visiting Rome, as it is also nice and cheap 🙂 Can’t get better than that! 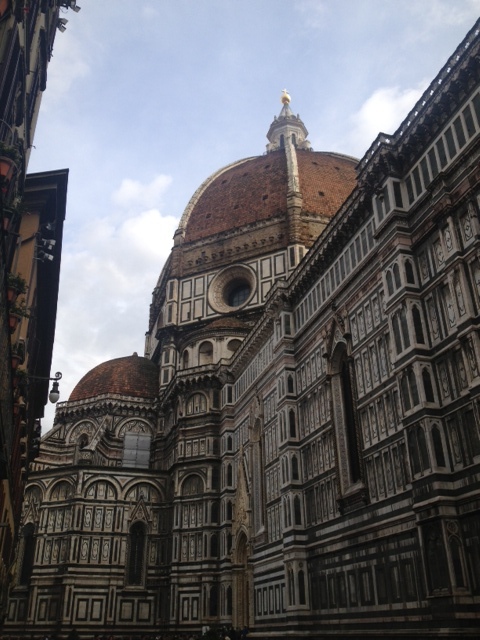 Ah, Firenze! 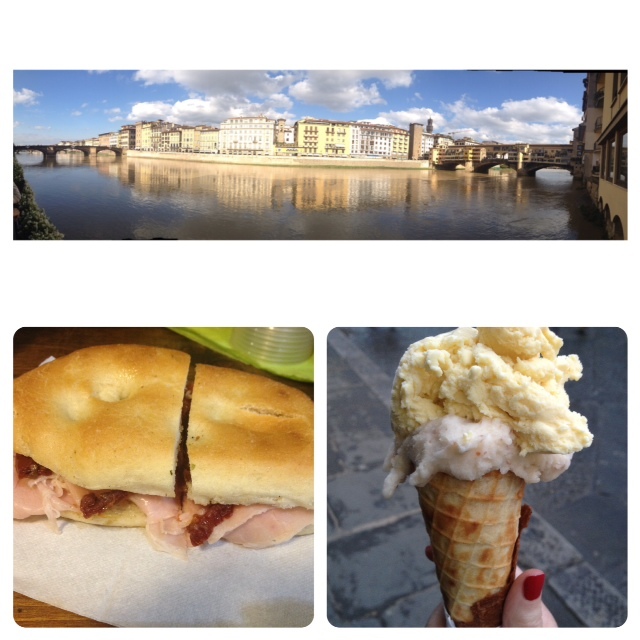 I really loved Florence, it was my next favourite place we visited after the amazing Paris. We were so lucky with our accomodation, we could see the magestic Duomo from our window – it was literally 50m down the street. I also loved that we didn’t need to take any public transport, which is big plus when you’re used to taking hot and stuffy underground tubes everyday! You can walk everywhere. There is so much culture in Florence – from the little laneways waiting to be discovered to the beautiful basilicas, we thought that Florence had it all. As far as food went, it was by far the best we had in Italy, and I had one of my favourite meals of the trip there. There were three places that really stood out for me. The first was a tiny little cafe called Il Panino del Chianti – which basically means a sandwich and a glass of (tuscan) wine! They had little share plates of cold meat and antipasti and a small selection of regional tuscan wines. They also had a special where you could choose 3 ingredients in a panino for 4 euros. Perfect! They were delicious, and so generous with the fillings considering how cheap it was. We went there twice and the first time I had proscuitto, sundried tomatoes and marinated artichokes (my fave! ), and the second time I had ham, pear and pecorino. Yum! It was perfect for lunch – not too big a meal, so you can still justify a pizza or pasta for dinner! 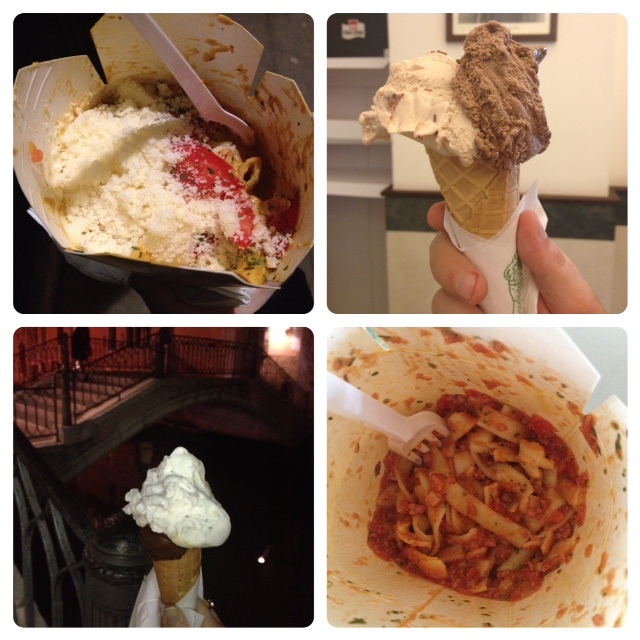 The second place was an awesome gelato shop called Grom, just down the road from our apartment. It was really fresh, full of flavour and decently priced. So, we went there every night! My favourite flavours were surprisingly Coffee, and the Dark Chocolate gelato, and my boyfriend loved the Nougat. Thirdly, is my favourite restaurant from the entire trip. This place was recommended to us by our host, and we were so glad we visited (twice)! 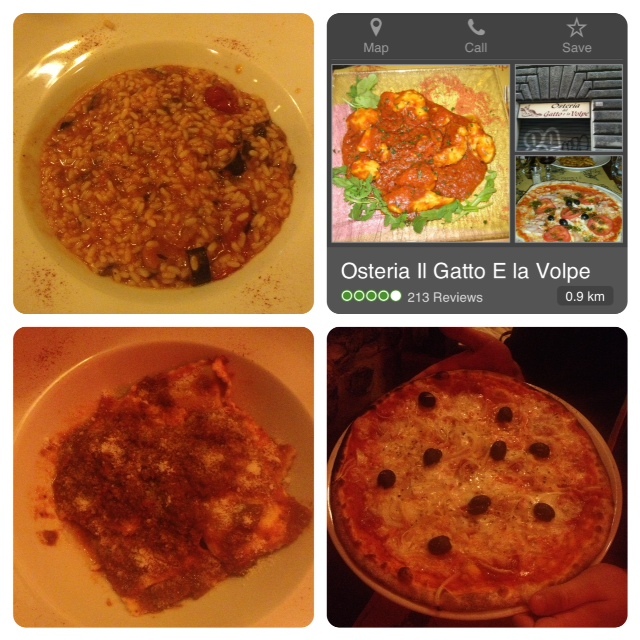 Osteria Il Gatto e la Volpe (The Cat and the Fox), was soooooooo good. Soooooooo good. I will happily keep repeating that it was sooooooo good. The reviews on TripAdvisor were also amazing, so it was a no-brainer for us! The menu was really big, which is usually not a good thing, but not this time. 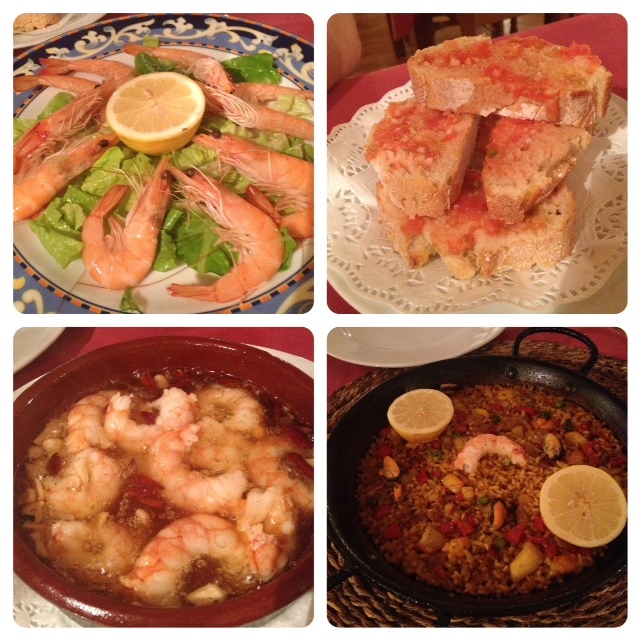 Everything that we had over the two nights was downright delicious, and we couldn’t fault anything. They serve warm bread before your meal comes, which is definitely homemade in their pizza oven – it was really yummy. They also make their own balsamic vinegar – the best I have ever tasted! It was really thick and had quite a grape-y flavour, and I would have happily drank the whole bottle! You can actually buy big wine bottles of the vinegar – if only we had the suitcase space! My boyfriend had a pizza both nights which he absolutely loved and thought it was the best he had in Italy, and that’s saying something, as he had a looooooot of pizzas! The first night I had a vegetable risotto, and it was great. Nothing pretentious, just freshly cooked with a simple tomato sauce and creamy rice. The second night was definitely the highlight for me – I had a ravioli filled with a super light mashed potato with herbs, in a bolognese sauce. I know it might not sound like much, but it was amazingly delicious. I still think about that dish, and yes, I did dream about it that night! I can’t wait to return to the Cat and the Fox, and I absolutely recommend it if you are ever in Florence! I can’t wait to go back to Barcelona! It was really hot when we were there, and then the one day we went to see the main sights, it was pouring with rain – typical! 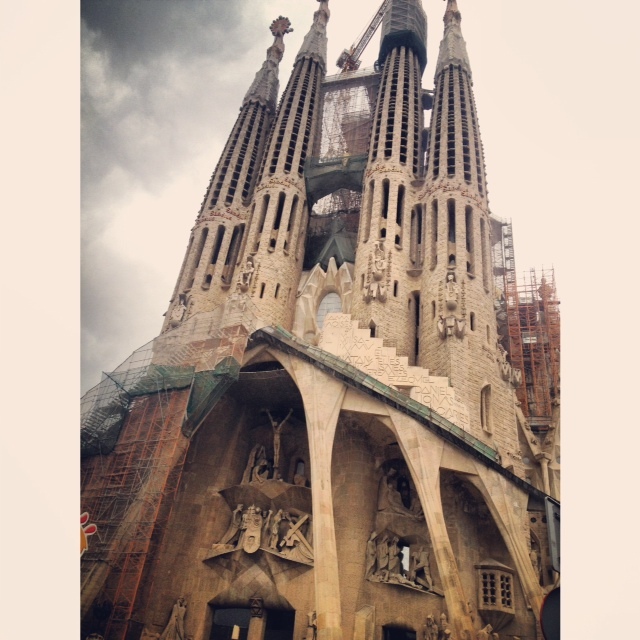 Barcelona was a really cool place, the city has a really chilled out vibe and there is plenty to see and do. As far as the food went, there were two places which we loved, and I’m sure there would have been more, but as our trip was coming to and end, so were our finances 😦 Both of these places were in the area in which we stayed – I think it was called Entenca, but don’t count me on it. It was just south-west of the city centre. The first place was a tiny burger joint called B Burger. Not traditionally Spanish, but it certainly had influences and was delicious enough, plus the owners were super friendly and explained everything to us in English. We had to make a reservation the night before, as the place is so small, they can only cook a few meals at a time. I loved this, as it meant the food was fresh and cooked to order, and the staff were attentive and were not run off their feet. We went to B Burger twice, and both times I ordered the Jamon Jamon burger, which had a fresh patty cooked medium rare (the more blood, the better I say! ), parmesan, rocket and proscuitto. Delish! We also had patatas bravas (small roasted like crispy potatoes) with a paprika aioli. B Burger also had amazing gin and tonics, my boyfriend and my favourite drink, and perfect to cool down with in the Barcelona heat. They were soooo big, and made with care by the owner complete with juniper berries. 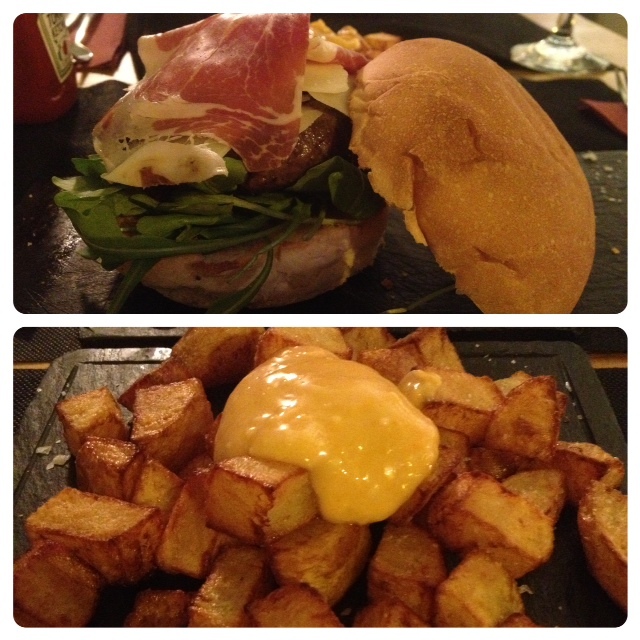 I would love to go back to B Burger next time I am in Barcelona. If you’re ever there and want a cheap and decent feed, make sure you ring and book the day before! There are a couple more little bits I want to add into this post, as they were simply too good not to share! The last 10 days of our trip were spent back in London, which is now easily one of my favourite cities in the world. 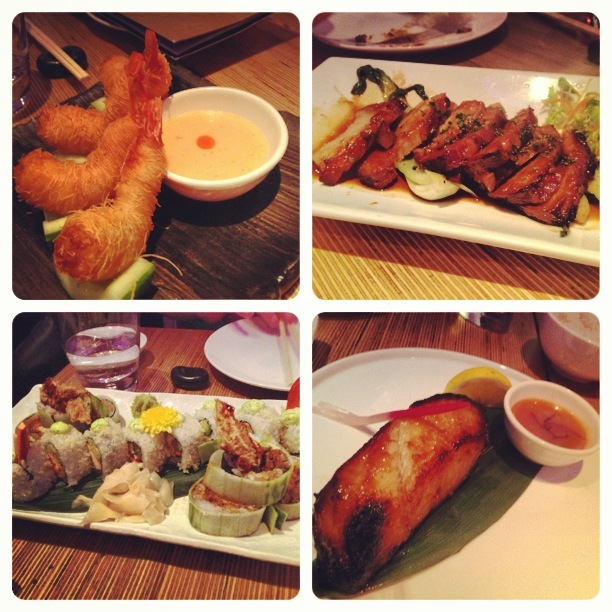 We went to a fantastic little Japanese place in the West End area called Tsunami, and it was fantastic. I am by no means a big fan of Japanese food but this restaurant may have slightly changed that! We had a range of things, and shared them all between the four of us. I really like the idea of sharing food, and it seems to have become quite the phenomenon in today’s society. I like trying little bits of everything and tasting new foods I probably would never order myself. At Tsunami we had kataifi prawns – king prawns wrapped in string like pastry and fried – what’s not to love? We also had tempura prawns, sliced hoi sin pork belly, dynamite chilli beef, soft shell crab sushi rolls and miso marinated black cod. The highlights for me were the tempura prawns, the dynamite beef which wasn’t too spicy considering its name, but it just had that nice bit of heat (I sound so wanky!! ), and the black cod. This piece of fish (bottom right below) was easily one of the best things I have had on this trip, second to the ravioli in Florence. It was deliciously flaky and so creamy, and the miso which it was marinated in gave it the most amazing caramel flavour and sticky edges. I’m not sure how else I can explain it, but it was really to die for. I would highly recommend. On our way back to Australia, we had a little stopover in Singapore. Our hotel happened to have the amazing Carousel restaurant inside, which has won a bunch of awards for its buffet dinner. So, of course, we had to go. 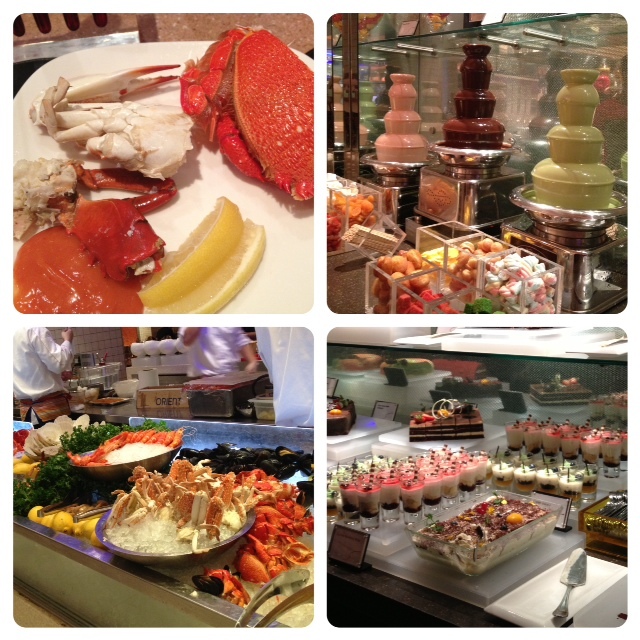 It was definitely the best buffet I have ever been to. The seafood section alone would have been enough, but they had everything. There were two dessert tables with great little layered shooters and cakes with chocolate airbrushing. They were all amazing (including the 3 chocolate fountains). We were lucky enough to have breakfast there, too, which also unsurprisingly fantastic.